I thought I would write down the questions I've accumulated over the two weeks of having a leopard gecko. You can answer any of them you want, any answers are appreciated! Does anyone have recommendations on where to buy feeder insects? Is there a difference between red dandelion leaves and green dandelion leaves when it comes to gutloading? Do calcium or multivitamin supplements go bad when left out? How much time should geckos normally spend in their humid hide? I've heard yellow urates means too many vitamins, is this always the case? Is it bad if it happens every once in a while? How yellow is too yellow? How big is too big when it comes to any type of worm? Are there any easy ways to tell when a gecko has or is about to shed? Last edited by TayKiren; 02-05-2019 at 07:50 PM. 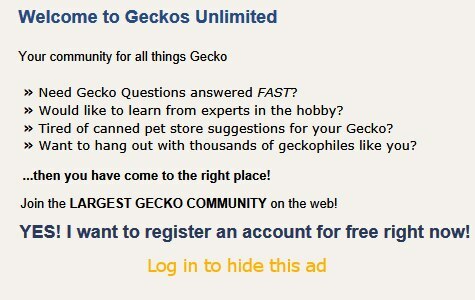 For one gecko, the best bet is the local pet store because any mail order feeder places will want to sell you 500 or more at a time. what you can consider doing is buying a small number of large crickets and a larger number of small crickets so the small ones can grow bigger as you're using the larger ones. That way, your crickets won't die of old age (9 weeks) while you're still using them for feeding. Is there a difference between red dandelion leaves and green dandelion leaves when it comes to gut loading? No, there isn't though I don't know that dandelion leaves alone is a sufficient gutload. I have been told that they "expire" after awhile, but I've never paid attention to that and my geckos are all fine. Just keep the covers on the jars when you're not using them. As much time as they want to. I think there's normal variability. I don't worry about it. If they throw it up, it was too big. I've had geckos as small as 10 grams consume a large superworm, so, once again, I don't worry about it. The only way to know is if it starts looking pale. Sometimes they shed and we never know. These answers are only my opinion. I tend to be a "don't worry about it" kind of person and other people armor exacting. Glad to know they can take a lot when it comes to worms. And don't worry, I won't be using just dandelion leaves. One of my previous females was an avid worm muncher. This was her first hornworm years ago and she continued to eat larger ones for as long as I had her. I've had a gecko puke food when too large (it was a roach for another gecko). They know when it's too big, but if you are concerned about size, try to pick prey that is a small as the space between their eyes when looking at the top of their head (good rule of thumb for most reptiles, those with legs at least).